I am excited to announce that on September 20th at 2:00pm I will he hosting a Hispanic/Latina Heritage Month event at the Wheaton Macy's. 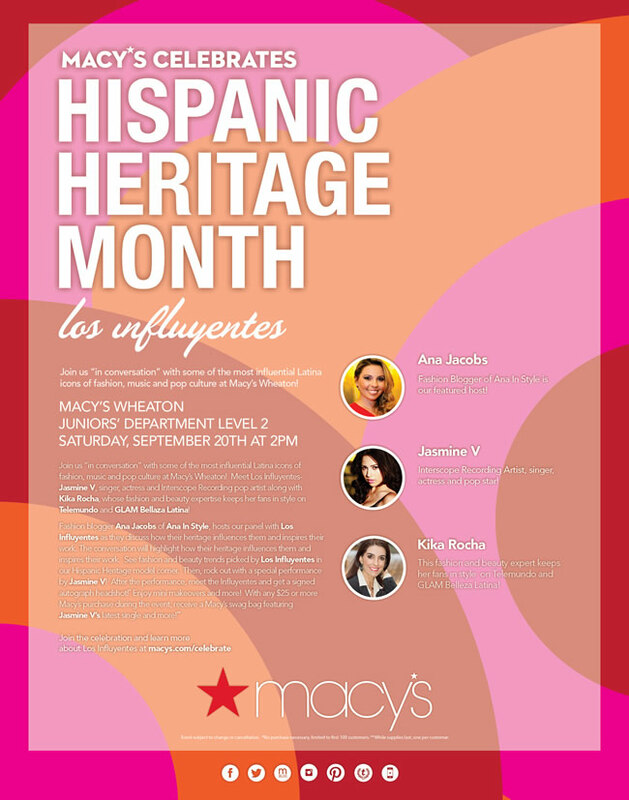 Join us “in conversation” with some of the most influential Latina icons of fashion, music and pop culture at Macy’s Wheaton! Meet Los Influyentes - Jasmine V, singer, actress and Interscope Recording pop artist, along with Kika Rocha, whose fashion and beauty expertise keeps her fans in style on Telemundo and GLAM Bellaza Latina! I will be hosting a panel discussion which these great inspirations, which will highlight how their heritage influences them and inspires their work. The event will also feature fashion and beauty trends, mini makeovers, sips and sweets, and of course swag bags. I hope to see you all there! No dia 20 de setembro às 14:00hrs, em um convite feito pela loja Macys, estarei apresentando um Evento voltado para a moda Fashion Latina na cidade de Wheaton em Maryland. Junte-se a nós para uma "conversa" com alguns dos ícones da moda, música e cultura pop latina. Também venha conheçer - Jasmine V, cantora e atriz, juntamente com Kika Rocha, que fala sobre moda e beleza na Telemundo e GLAM Bellaza Latina! Eu vou estar apresentando o painel de discussão com essas grandes inspirações. O bate papo vai falar sobre como a influência de nossas raízes latinas inspiraram o nosso trabalho!! O evento também contará com as tendências de moda e beleza, mini-make up, muita guloseima, e, claro, sacolinhas de presentes. Espero ver todos vocês por lá! Para maiores informações clique aqui!! Que chic, ANA!!!! Parabéns por mais este evento! ARRASOU!